Sparta. Wow. This one is difficult to write about. It is difficult to describe the challenge of the event. It’s difficult to describe the emotions. It’s difficult to convey everything that went on the day of the race without slipping into hyperbole and over-dramatization. There are signs everywhere that simply read “Spartan Race – You’ll know at the finish”. It might be able to frame the challenge by putting it in context with other events I have completed. It took less time to run than it did to ride the 5 Boro Bike Tour, but just barely at 4 hours. It was similar to the Rugged Maniac, but the race was a mile longer and the obstacles were far more difficult to complete. Plus, there was a punishment if you failed an obstacle that didn’t exist at the Rugged Maniac. If was far more physically challenging than the metric century ride on Martha’s Vineyard, or even the Hilly 40 mile ride that caused my legs to cramp so severely that I fell off of my bike multiple times. It was far more mentally draining than any of those events as well. 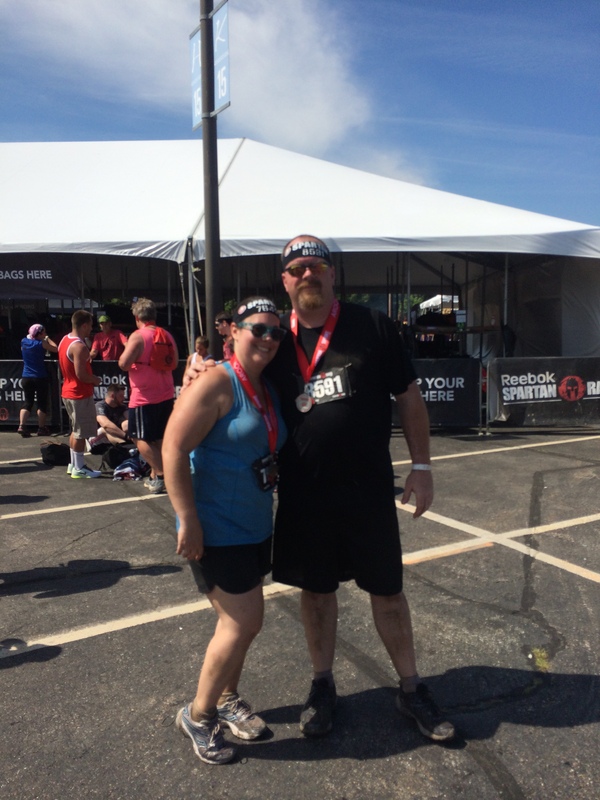 Angie and I decided to run the Spartan Race on a whim. There was a deal on the entry fee that saved us 15% and when we committed the race was months away. It seemed like such a good idea at the time. Plus, it was at the Mohegan Sun casino, so we knew that we could always have a good time if the race didn’t go well. At least that was the plan. We had a midday start so we could already see the racers running as we drove to the casino. They seemed impossibly far from the building, and everyone was walking or barely jogging. And they were all in phenomenal shape. We began to worry right at that point. Once we pulled into the parking garage we parked on the top level and we were able to see across the campus to the staging area where the Start/Finish line was located. We could also see the complex of finishing obstacles. There was a fire pit to run through, the Hercules Hoist, a three story high pallet ladder attached to a cargo net bridge that spanned the main access road to the lower casino, a water obstacle that led to an inclined wall that you use a rope to climb over, and a wall that you traverse by clinging to small blocks. That was all in the last 200 yards. I went from worried to completely intimidated. If those were the only obstacles I would have been worried, but we also had to run 4.5 miles and tackle 20 other challenges. We quickly gathered our gear from the car and headed down to the staging area. Once we stepped into the registration and staging areas we knew we were in over our heads. Even the envelope the timing chip came in stated “There is a real possibility that you may die or be catastrophically injured”. This took away my obstacle race logic that always saw me through every race. Sure, it looks dangerous, and if you fell exactly wrong you could get hurt, but they wouldn’t let everyone do it if it weren’t safe. Ummm, yes, at Spartan they would. It all became very, very real to us. Something else happened though, something unexpected. Every single racer we met offered support and encouragement. Angie and I had resorted to gallows humor to try to stay calm and focused. Anyone who heard us worry would interrupt and say “You can do it, even if you think you can’t right now. You WILL finish”. You will finish. Every Spartan Racer had that attitude. Not I will finish, but you will finish. We will finish. The race is a blur. We climbed over a wall into the start pen with the rest of our wave just like the Rugged Maniac, except a foot higher. Racers were already helping each other just get to the start line. 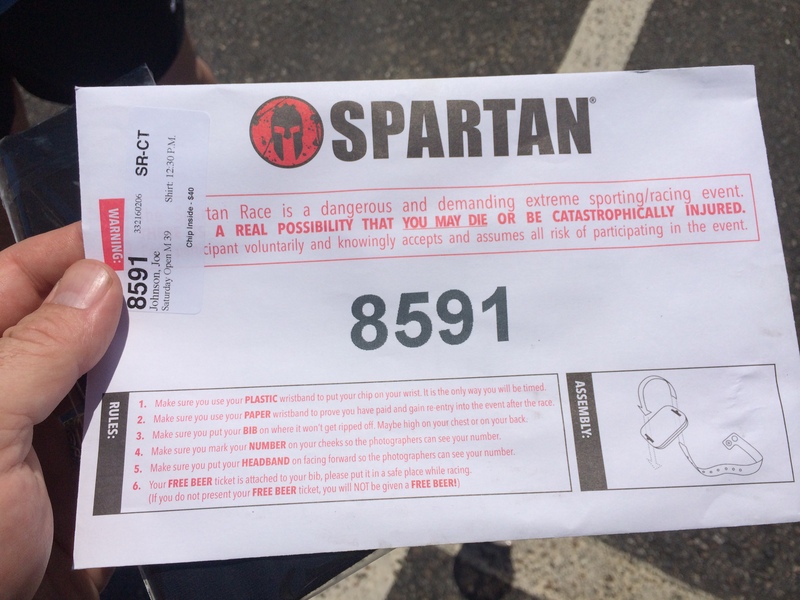 The starter had everyone chanting a response to the question “Who am I?” “Spartan!” The gun went off and we ran. The first obstacle wasn’t really one at all but it caused the first injury. The course ran through levels of the parking garage and over guardrails. Angie fell. She got back up and would later complain that her biggest bruise was from that guardrail. We ran up hills and through drainage ditches until we came to the first real obstacle, an eight foot wall. Up and over, followed by more running. I briefly thought that things were looking better until we ran out of the forest we were in and smacked into the first of the obstacle complexes. Much like the finishing complex there were a group of challenges one after the other designed to wear you down. First was a crawl under barbed wire. This is found in every race, but the wire was hung much lower and it was real. It was sharp. People were bleeding on the other side, and that was over 50 yards away. Not 50 feet, 50 yards. Once through that you had to go up the inverted wall. It was only 6 feet high, but it was tipped back toward you so there was little purchase to help you over. Once over the wall there was a water station marking the first mile and a downhill jog of about 200 yards. That was to allow you to grab your sandbag and run back up the same hill, traverse the ridge for 100 yards, then run back down. Your 80 pound sandbag. It felt more like 100 by the top of the hill, and 150 pounds by the time you were allowed to drop it. Once we finished that we found the nicest family in the world. Angie was struggling in the first half of the race. She had injured herself early and was suffering from a lack of water. If you are running a Spartan, bring water. Bring a hydration pack. It’s worth the extra weight. She downed water at the first water station but it wasn’t enough. She lost it all on the sandbag carry. As we jogged up a road after the carry she was already overheating when we met them. There was a family that had decided to cheer on the racers as they passed their house. The kids were giving high fives and cheering as we passed and the dad had a water hose that he would spray at racers if they were overheating. I thought Angie was going to cry with relief as he spayed us. The ambient temperature was in the mid-90s and I can’t imagine anything feeling better at that moment than the ice cold spray from that water hose. We quickly were back into the woods when I failed my first obstacle of the day. A 30 foot high cargo net that you had to climb up and over to succeed in the challenge. I climbed up and froze. I am ashamed that I didn’t get over, but I couldn’t force myself over the shaking net. I backed down and suffered my first punishment, 30 burpees. Burpees are a painful crossfit exercise that starts in a standing position and has you drop into a crouch, kick out your legs into a push up position, do a push up, bring your legs but into a crouch, then explode into a jump. That’s one. Each failed obstacle results in 30. I had never done one before that day. They sound easy. Go ahead, try one, I’ll wait. Hard wasn’t it? Try 30. After failing an obstacle you have already spent a fair amount of energy so the punishment is always worse. I can honestly say that if I knew what 30 burpees were going to cost me I would have gotten over that net. Here again I was stunned by the community of the Spartan Racers. Everyone cheered me as I finished my burpees and clapped. They knew the pain and wanted to encourage me. Once we cleared the woods it was time for the second obstacle group. First we had a 10 foot wall, followed by a spear throw, a 20 foot rope climb, and then three more walls called “Over, Under, Through” were you did exactly what the title said. Over the first, under the second, and through the middle of the third wall before continuing on to the next run. I failed two out of the four obstacles and did another 60 burpees. At this point I was sitting on a concrete wall and drinking water from the 2 mile marker water stop. I still had the Over, Under, Through obstacle. I was shaking and starting to think about quitting. I was doing more than thinking. I was sweating and cramping and ready to call over to the paramedic to give up. They had asked me twice if I were okay and I said yes, I just needed to drink some water. Angie brought me another cup and asked how I was. I told her and she exploded on me. I hadn’t let her stop when she was injured, I got her into this with the discount, and she wasn’t about to let me quit now. She got me up and pointed toward the next wall. I made it through and kept going. Everything gets much hazier after that, but I kept going. We had more obstacles to conquer, but thankfully they were much more in line with my strengths. We had to carry Atlas Stones, 100 pound round boulders. We had to flip tractor tires across the parking lot. There were a couple of lower walls. We had to traverse rocky drainage ditches and climb culverts. Angie and I were humbled and happy to pass the three and four mile markers. We were both blown away by the people who were still running at this point. We had long ago resorted to walking. One vivid memory is when the course went behind the casino area where most of the restaurants are located. People were out on the deck cheering for us and promising to save beers for anyone who made it there after the race. I wanted to hug every one of those strangers as they cheered us on, wanting us to finish. We finally made it back to the finishing complex and only had those final obstacles ahead of us. The first obstacle was the three story pallet ladder to the bridge over the road. It was surreal to look through the cargo net at giant busses passing below you. After that it was the cliff hanger wall. I mounted the wall, got halfway across and fell. I wanted to cry. I lay on the hot asphalt and tried to get up, knowing I had 30 more burpees to go. The heat from the blacktop was the only thing that finally got me moving. I could feel it starting to burn my shoulders. I had to go face the music. Almost thankfully Angie had fallen as well. We did our burpees together, encouraging each other to finish knowing the rest was something we could accomplish. We could see the finish line. The Hercules Hoist was a pulley system that had a 100 pound sandbag attached to a rope, you pulled it up and lowered it down. The only problem most guys had is the weight would pull them off of the ground or out of position so that they never had leverage. Racers took turns holding each other to the ground so they could lift the bags. After that it was through the water, over the wall, jump the fire and cross the line. I crossed the line, received my finishers medal and collapsed. A volunteer helped me up and hugged me, telling me how proud they were. I was a finisher. A random stranger crossed the line and grabbed me, hugging me because we both made it. He was already crying. I found Angie and hugged her, starting to cry. I was beaten and broken. I was cramping and dehydrated. It took me over 4 hours to finish, but I did finish. Just like the sign promised, I knew at the finish. I knew that there was a part of me that would never be the same. I took on something bigger than I thought I could and I beat it. I survived what I thought would cause me to quit. I did it with friends and stranger’s support, and there is no way to ever thank them other than to do it again and help more people feel that same feeling. That is the other surprise I had that day. Knowing, as beaten and broken as I was, that I would be back. Me, the fat guy that rides bicycles that has turned into the fat guy that runs 5Ks and obstacle races. The guy that probably shouldn’t have tried a Spartan Race yet, and probably should have quit before he really got hurt. I will be back. I can train harder and run the course faster. Once I do that, there are other Spartan Races to run, longer and harder ones. Once you finish a Sprint you can race a Super. That’s 9 miles and more challenges. Once you finish that you are qualified for the Beast, 15 miles and 40 obstacles. Maybe I can accomplish it, maybe I can’t, but I will be back to run the Sprint again. This time I’ll be faster. This time there will be less burpees. There is only one other question. Who’s coming with me? It’s a year from now, plenty of time to train, are you in? This entry was posted in challenge, fitness and tagged challenge, I am Spartan, Life Transformation, Obstacle Race, running, Spartan Finisher, Spartan Race. Bookmark the permalink. Burbees and I are not friends. That — as well as much of the grueling lineup — would certainly not fall among my favorites. You took on a Goliath of a challenge. I’m in awe, my friend. 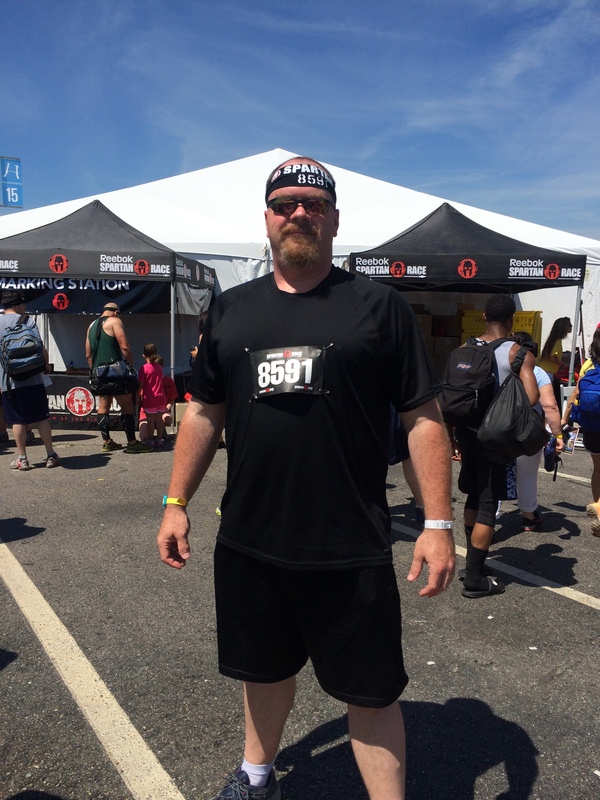 Joe, you made the Spartan Race so vivid that I could see the obstacles and feel your reaction to them. Your descriptions of the other racers and the people that encouraged you to finish the race made me feel like they are people I would like to meet. Well done not only on your column but also on finishing the race. You and Angie deserve a round of applause!